The Phoenix Suns are basically toast in the Western Conference playoff race, and they were going up against the lowly Hawks at home last night. But that lack of high stakes doesn’t mean there can’t be any thrilling late-game drama. The Hawks, who led by 12 with five minutes to play, were down 102-101 with possession and under 10 seconds left in the fourth. To regain their advantage, Dennis Schroder lobbed the ball up at the basket for Taurean Prince to slam it home. But Marquese Chriss rushed over from the top of the key and got right in the way, nabbing the super block and the win for his team. 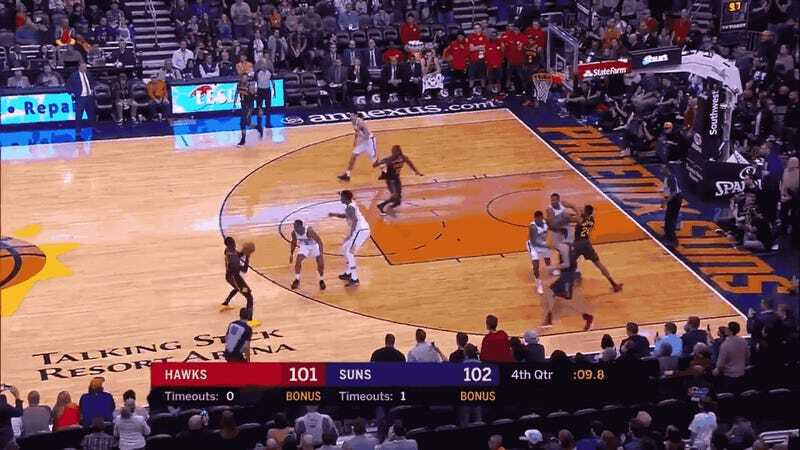 The Suns made their subsequent free throws and won, 104-103, because Schroder—perhaps still shook from that rejection—inexplicably took and made a two-pointer at the end. Congrats as well to Devin Booker and his 34 points, but honestly, from my view, that play from Chriss is so much cooler than making the winning shot.